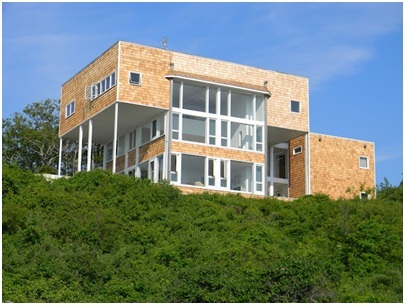 What would you do if your family owned a 3 story, 7 bedroom home situated on 3 acres, right on the Atlantic ocean ? You would renovate, of course ! And that is just what the Kelly family did. 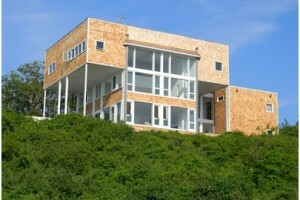 Here is a picture of the house, as viewed from standing on the beach. Replacing all the trim (over 2500 linear feet of it) with custom fabricated AZEK composite trim. Remove the existing oil burner, boiler, and associated duct work. Replacing the subfloor. Refinishing the hardwood floors on the first floor. During the Winter of 2012 and Spring of 2013 we will continue to add value by design and implementing improvements and updates to this magnificent home. Bill and Eugenia did not like the drafty windows, they did not like seeing the curtains move when the wind blew, and they were tired of the old storm windows that never really seemed like they got clean enough. They loved their house though. So, they decided to renew it. New windows (30 of them), new siding, and a clean fresh coat of paint. The home was build in 1895 and the majority of the windows and doors were original to the house. The first step was to decide exactly what improvements would be made, and identify the opportunities to both save energy, and improve the aesthetics of the home. The most important activity at the outset of any renovation project is to develop a concise plan identifying areas to be renovated, costs for materials, and accurate labor estimates required to achieve the result. Projects are more successful if there is a clear identification materials, costs, construction process, and estimated timelines. Here is a picture of the South elevation, and the identification of each component in the elevation. We produced this by taking a picture of each area to be renovated. These areas were identified for renovation in 6 project ‘phases’. All materials and labor were entered into a database, and accurate estimates were provided for materials and labor, by phase. If you are interested in looking at the entire proposal for this project, please call me at 617-201-4375 and we can meet to review our estimation process. I am more than willing to share the actual numbers in person with any potential client. There is, of course no obligation to do anything. The final 12 page powerpoint presentation has pictures of each section of the home, the renovation to be applied, and costs for materials and labor. Pilot Phase – we started by replacing one window, and 100 sf of siding. This allowed us to verify the window size, trim details, and build confidence in our estimates for materials and labor. As part of the pilot, we added 1.5″ of polyisocyanurate insulation board to the exterior sheeting. This added an R-Value of 10 to the home, and provides an air-tight wall assembly. Although we did not apply the foam board to the entire home, we were able to accurately determine the cost-benefit associated with this improvement. Windows There were over thirty windows in the home, over 4 levels. Starting in the front (pictured above) there were 11 windows to replace as well as the front door. Circle tops and Appliques: The windows on the second level have semi-circles on top with appliques featuring morning glories and bows specific to the period in which the home was build. These were plaster casts and could not be repaired. New radius’ were build cut from sheets of AZEK composite board to receive the new appliques which were matched by Jack Meingast at Decorators Supply Corporation and produced in resin. Special order, extra wide windows: The front-most windows have a glass width of 48″ which is exceptionally wide. We selected Marvin brand windows for these two windows and the flanking windows because Marvin was the only manufacturer who could produce a window this wide. These windows also feature a grille pattern containing 17 lites on the top sash. Marvin was able to produce a modern solution for us, while maintaining the look of the original 120 year old presentation. A Marvin Glider was selected for a kitchen location which opens up onto a beautiful round porch. The existing casement window it replaced opened into the porch area and restricted the traffic flow. The operating side of the two-pane glider slides over the fixed side, allowing maximum air flow without restricting the living space on the porch. Bill and Genie selected the Andersen 400 series for all other windows (18 units) in the home. This selection was made based on the price and the features of the windows over the Marvin Integrity series windows. All windows ordered from both Andersen and Marvin were new-construction style windows. Victorian Fireplace Since we were essentially renovating the entire exterior of the home, Bill and Genie decided to add a Victorian style gas fireplace in the front Living Room. We installed a Valor brand appliance from the Victorian Fireplace Shop in Virginia. Once installed, a custom mantle was added which compliments the proportions, and the style of the room. New siding and Trim – There was over 2000 square feet of siding to be replaced (Clapboards on the 1st level, Red Cedar Shingles on the other three), all the window trim+ sills, as well as the frieze board detail between the levels of the home. Repairs were made to the soffit and cornice below the roof line where necessary. Painting – the new siding and trim (pre-primed) was primed (again) and painted with two finish coats of Benjamin Moore brand paint. Wrapping it all up – There are many details I did not mention in this blog like fixinging sagging interior plaster, installing doors, and many other activities which make the final result spectacular. We love what we do. We want very much to produce work that is well thought out, accurate to the architecture, and flawlessly executed. If you have a renovation project in mind, we can give you the benefit of our experience so you know what it takes to make your home into the place you want it to be. T H AN K S B I L L A N D G E N I E !